Media are an important part of our lives—from computers, laptops, tablets, and smartphones that let us learn, communicate, and create, to movies and TV—and movies streamed on smart TVs that entertain and inspire us. But, not everything we see, hear, and learn about on digital media in our world is good for us. Media can bring us messages from advertisers—aiming to sell us products that can keep our family from ideal wellness or even harm our health. For example, fast food advertising can make eating right very difficult. And, eating in front of a screen can lead children and adults to take in excess calories and promote obesity. Too much sedentary media time can also displace healthy physical activity and play. Studies have shown that excessive TV watching is associated with obesity and overweight in children. One way to avoid this outcome is to limit digital media/screen time to no more than one hour a day for children ages 18-24 months and beyond. See Why to Avoid TV for Infants and Toddlers. Digital media is not appropriate for children younger than 18 months, because babies need 3D, real world interactions with you and other family members to learn and grow. Avoid using TV, digital media, or apps as a babysitter. Instead, look for ways to interact with your child face to face. If you are going to use digital media with your 1 ½ to 2-year-old and beyond, co-view the programs or play the games with your child. Children learn better when they hear a parent or caregiver repeat an electronic word or message. Of course, it's okay to video chat with a relative through a screen. Just stay by your child's side to engage everyone in an active conversation. There is plenty of unconscious eating that can take place in front of a TV or other screen. It's easy for kids to simply eat their way from one program to the next. Distracted by the TV or the app, they'll often eat long beyond when they're full. The result? Weight gain. Plus, too much screen time is likely to keep your child from engaging in active play and important face-to-face communications with friends and family. Serve your meals at the kitchen table with other family members as often as possible. Meal time is an important time for family conversations and sharing the day's experiences without media getting in the way. Here's another important reason to limit your child's TV watching: the steady stream of ads for high-sugar, high-fat foods aimed directly at children. Studies have shown that children who watch a lot of TV have a greater likelihood of becoming obese. The commercials targeted at children are one of the reasons why. Do not allow children younger than 18 months to 2 years to watch TV or use digital media. Develop a Family Media Use Plan that ensures that media do not displace other healthy activities such as active play. Talk about the ads your child sees on TV and online and explain how they encourage unhealthy eating or behaviors. Stay strong when your child begs for the latest food or candy advertised. Explain why you think it's not healthy and offer a healthy substitute such as a vegetable or fruit if he or she is hungry for a snack. Even if your child doesn't eat in front of the TV, you still need to develop a Family Media Use Plan that allows enough time for healthy meals, adequate sleep, and enough physical activity. 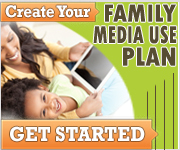 Develop your own Family Media Use Plan today!